Bigger is better when it's time to party. Ideal for large rooms and open areas such as living rooms, patios, or open-floor-plan homes. This large speaker is top of the line, for those who demand the best, biggest, loudest. It plays cloud music, music stored on your phone or tablet, plus USB sources, too. Now you can even listen to your favorite Bluetooth enabled sources on your HEOS system. Sounds like a party already, doesn’t it? Sculpted to project prodigious performance, the HEOS 7 is beautifully finished with rich genuine materials, including a brushed metallic apex. It also features a crafted blend of five custom drivers, two passive radiators, five Class D amplifiers, all of which are controlled with state-of-the-art digital signal processing. 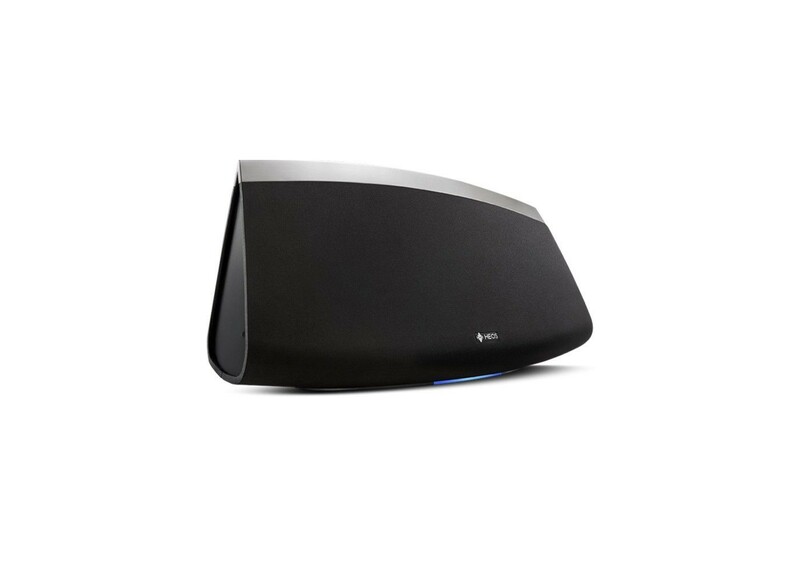 Created for those who demand the very best, HEOS 7 delivers room-filling sound even in large, open spaces. The stylish and elegant enclosure is packed with advanced technologies, including dual mid-woofers, dual precision tweeters, an active subwoofer and dual passive radiators, and the active drivers are powered by five Class D digital amplifiers. Sound is optimized via a suite of precision DSP acoustical processing algorithms that originated in the recording studio. 7 Driver Speaker System: 5 active drivers, including 2 precision tweeters, 2 mid-woofers, 1 subwoofer. 2 passive radiators provide additional bass augmentation. Class D Digital Amplification: 5 channels of Class D digital amplification provide high efficiency, lowest distortion and widest dynamic range. Headphone Output: Equipped with a standard 3.5mm stereo headphone jack, the HEOS 7 features automatic speaker muting when a headphone plug is inserted into the headphone jack. Auxiliary Analog Line Input: The 3.5mm stereo analog auxiliary line input lets users connect a device with analog stereo output directly to the HEOS 7. Music Subscription Services: The HEOS app lets you choose from popular subscription streaming services including Spotify, Pandora, TuneIn, Amazon Music, iHeart Radio, SiriusXM, SoundCloud, TIDAL, Napster, Mood:Mix and Deezer. More services will be added soon. Internet Radio Stations: Choose from your favorite internet radio stations and listen to MP3 and WMA streaming audio. Picture Formats Supported: HEOS 7 supports JPG, PNG, BMP and GIF album art picture formats. USB Drives Supported: HEOS 7 supports USB thumb drives via the built-in USB port. Music content on a USB drive can be played back locally, or on any or all HEOS players on your network. Wireless Connection: Connect to your wireless network quickly and easily. HEOS 7 supports the latest 802.11 networks (including dual band "N") for the most reliable network connection. Ideal for: large rooms and open areas such as living rooms, patios, or open-floor-plan homes. What's In The Box: HEOS 7 player, AC power adapter, 3.5mm setup cable, Ethernet cable for wired LAN hookup, Quick Start guide.